Mango, is a state-owned South African low-cost subsidiary of South African Airways. The airline, which commenced service in 2006, is based at OR Tambo International Airport near Johannesburg. Mango Airline operates a modern fleet of bright orange next generation Boeing 737-800 aircraft (9 in total). The airlines offers services to nine destinations, primarily within South Africa. Mango’s boarding process was smooth and efficient with the use of their zonal format. Within a few minutes we were onboard via an aerobridge. This is always a plus when it comes to travelling on low cost carriers where tarmac walking to embark or boarding an over crowded bus to ferry you to aircraft is the norm. A friendly Flight Attendant gave us our emergency exit briefing and it was time for departure. A standard seat features 30 inch of legroom. Passengers should not expect a particularly impressive seat with it lacking the quality feel, however, when compared to other low cost carriers it was on par. All seat-backs feature a hard plastic shell in place of where you would typically find the seat pocket. The seat pocket has been moved to the very top of the seat back and the plastic shell in it's place eliminates completely the possibility of feeling those annoying knees in your back from the person seated behind you. Mango offers their customers a wide range of very affordable food and beverage products on a 'pay as you go' basis. Details on their offerings can be found in their on-board menu in the seat pocket. We opted for two South African chardonnays, cheese and biscuits and the traditional dried meat that South Africa is famously known for - Biltong. Our purchases totaled just ZAR185 (approx $15 Australian dollars). Wi-Fi is also available on five out of the nine Mango aircraft (additional charge). Unfortunately Wi-Fi was not available on this flight It's important to know that Mango only accepts credit card payments on Wi-Fi equipped aircraft. Cash payments in South African Rand (ZAR) are all that is accepted on aircraft that do not feature Wi-Fi. This caught a number of fellow travellers out leaving them unable to make credit card purchases in flight. As mentioned make sure you have cash and card on hand as payment on board for purchases will vary between the two depending on whether your flight has Wi-Fi or not. Mango caters for customers not only wanting the lowest fare, but also customers wanting to experience a little luxury along the way. A lounge pass will cost you just ZAR200 (Approx $18 Australian Dollars), and gives you access to the lounges's African buffet, fully stocked bar and Wi-Fi up to two hours prior to domestic and four hours prior to international flights. If great value is what you are looking for when travelling inter-Africa, Mango Airlines is a very hard beat. The overall guest experience is just as good as any of the main, full service carriers operating similar aircraft on similar routes, at half the cost. I would highly recommend South Africa’s newest airline to anyone traveling within South Africa. A standard seat features 30 inch of legroom. 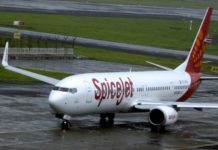 Passengers should not expect a particularly impressive seat with it lacking the quality feel, however, when compared to other low cost carriers it was on par. All seat-backs feature a hard plastic shell in place of where you would typically find the seat pocket. The seat pocket has been moved to the very top of the seat back and the plastic shell in it’s place eliminates completely the possibility of feeling those annoying knees in your back from the person seated behind you. Mango offers their customers a wide range of very affordable food and beverage products on a ‘pay as you go’ basis. Details on their offerings can be found in their on-board menu in the seat pocket. We opted for two South African chardonnays, cheese and biscuits and the traditional dried meat that South Africa is famously known for – Biltong. Our purchases totaled just ZAR185 (approx $15 Australian dollars). It’s important to know that Mango only accepts credit card payments on Wi-Fi equipped aircraft. Cash payments in South African Rand (ZAR) are all that is accepted on aircraft that do not feature Wi-Fi. This caught a number of fellow travellers out leaving them unable to make credit card purchases in flight. As mentioned make sure you have cash and card on hand as payment on board for purchases will vary between the two depending on whether your flight has Wi-Fi or not. Mango caters for customers not only wanting the lowest fare, but also customers wanting to experience a little luxury along the way. A lounge pass will cost you just ZAR200 (Approx $18 Australian Dollars), and gives you access to the lounges’s African buffet, fully stocked bar and Wi-Fi up to two hours prior to domestic and four hours prior to international flights. If great value is what you are looking for when travelling inter-Africa, Mango Airlines is a very hard beat. The overall guest experience is just as good as any of the main, full service carriers operating similar aircraft on similar routes, at half the cost. I would highly recommend South Africa’s newest airline to anyone traveling within South Africa.